A close adviser to Greece’s former Finance Minister, Yanis Varoufakis, gives an insider view of the government negotiations with the Eurogroup. Interview by acTVism Munich. Deutsch. 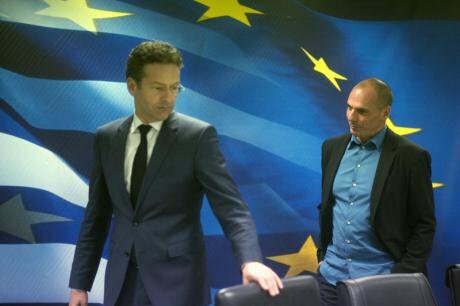 Eurogroup president Dijsselbloem meets Greece's finance minister,Jan.'15. Demotix/ Angeliki Panagiotou. All rights reserved. Rees Jeannotte, acTVism Munich. (RJ): James Galbraith - thank you for joining us! RJ: So Sunday, July 5, was a very big day in Europe and an extremely important one for Greece. The people of Greece voted overwhelmingly to reject the bailout terms set by ‘the institutions’. They voted ‘NO’ in a bid to end 5 years of painful austerity.Can you give us a quick synopsis of the lead-up to the referendum and your thoughts on these past 5 days since the referendum. There has been some major happenings with Yanis Varoufakis stepping back, Samaras stepping back and I think something that will be on a lot of peoples minds is: Why was the referendum necessary? Since it appears that they have accepted most of the austerity that Greece voted against. JG: Well it was a very peculiar situation. The referendum became necessary because Alexis Tsipras realized, I think in some way, on the June 26 that the institutions were not prepared to give him anything that he could bring back to the Greek parliament that would be acceptable. Greece had come up with a proposal which made really drastic concessions to the enforced austerity that they’ve been under. They simply wished to do that in a different by increasing taxes on high income individuals and on business profits of a certain level. The institutions refused to accept that and insisted on cuts to low-income pensions and on increases in the value-added tax, especially out in the Islands where it is very destructive to the tourist trade. So that was an impasse that had to be resolved somehow. I think it is fair to say that the expectations on a part of the Greek government was that, given the alternative of a ‘NO’, which they recommended and a ‘YES’, which would avoid a closure of the banking system and given the extreme campaign of intimidation that was pursued in Greece, they expected that the Greek population would vote ‘YES’ and that the government would then be under an obligation by basically the mandate of the people to sign onto the terms and to put an end to the crisis even on terms that they themselves regarded as being very damaging and unacceptable. That was the extent to which they were backed into a corner, interestingly, and very much to their credit the Greek population said ‘NO’ and they stood up and they were very brave about it, in the face of a week of fantastic media intimidation and efforts to instil fear and anxiety into the population, which the population simply refused to buckle under and so you got the referendum results that we saw on Sunday night. However that did not change the underlying situation which was that the government had no options short of taking Greece of the Euro which they were not prepared to do and did not feel they had the political mandate for. So they were faced again with the necessity of coming back and attempting to extract at least the cover of some debt restructuring and refinancing as the price for accepting most of what the Institutions and what creditors countries were demanding. And that’s what happened. Obviously, Yanis Varoufakis departed in good order because that would have been something extremely difficult for him to take responsibility for as Finance Minister. RJ: So, there has been a lot of criticism especially from the Left regarding Syriza’s strategic approach to the negotiations, with some saying perhaps it was a bit naive to assume that the so-called “European partners” were willing to negotiate in good faith. Can you respond to that criticism? Would there have been some other strategy they could have adopted that would have been any more successful? JG: Well the Greek government, and particularly the part of it that I spoke to and happened to be speaking to all the way through, were not under any illusion about the hard line that the creditors were going to take at the end of January. That was stated both publicly by them and in private by Wolfgang Schäuble. So the fact that the creditors were not going to give any thing short of the original memorandum was something that was imminently clear to insiders from the very beginning. But that’s something that you have to demonstrate to the larger public. It is not obvious to the wider world that this intransigence is the case, particularly when the European institutions who have a very powerful media machine, kept talking about how flexible they were. The IMF kept saying how flexible they were and basically spreading an entirely different cover story to the world. So the Greeks had to stick with the negotiations up to the very end basically in order to establish what the true terms of the discussions were. I think that’s now clear to the world (unclear closing sentence). RJ: You assisted former Greek finance minister, Yanis Varoufakis, in the negotiations. Something that I think a lot of people might find interesting is how these negotiations actually function. There is not a lot of transparency on what goes on except for when the European Union decides to leak strategically whatever it feels like leaking. I think it will be interesting for people to understand the reactions to Syriza - this left-wing government coming into European politics – at that level. JG: Well there are many things that one can say about that. One that comes to mind I think is that the European institutions, the collection of finance ministers known as the ‘Eurogroup’, were plainly unprepared for and quite shocked by the audacity of a government coming in with a well-articulated critique of the entire policy structure under which Europe has been labouring for the last 5 years. And that created a very considerable amount of tension because that was something to which they had no credible response. So the response that they chose was to go after Yanis Varoufakis particularly, personally, and to make him out in the press to be something quite different from what he actually is and that you know is a reflection of their raw power with respect to the media and also to the complete lack of scruple in dealing with this government that was difficult by virtue of the fact that it was expressing ideas that they not want to hear, that were plainly well argued, well grounded in fact, and plainly very difficult for people who were committed to contrary ideas to accept. RJ: Yes you have this rhetoric with this idea that Syriza is inexperienced, and quite a lot of condescending talk, with Christine Lagarde saying that they need “adults in the room” and such talk. So it seems apparent at least from that one side. Was this basically a one-sided assault. From our view it didn’t seem to come from the Greek side. JG: Well there is no question that the whole process was extremely one-sided. You had the representatives of one small country, who admittedly were new to government and did not have the staffing that would be required to go up against the establishment that they were facing; and on the other side you have an enormously entrenched bureaucracy and all of the powers of Europe behind them. So yes, it was extremely one-sided and the approach the other side took, the European side and the IMF took with every Greek proposal was just simply to say, “Go back and do it again, not acceptable”. They never gave any ground on of their own. They never came back and said, “Here is a concessions we are prepared to make.” They weren’t prepared to make any concessions. They simply said, and toward the end they were utterly blatant in the threats that they made, that if the Greeks did not come to terms on the “precise terms” specified by the institutions, then the European Central Bank would act in such a way as to destroy the Greek banking system and to seize the deposits of the Greek citizens and that is a very powerful threat. Because once your banking system is gone your economy cannot function. So what we have here is an agreement at the end of the day, that is not an agreement. It is a contract that is being signed under force majeure, under coercion. It is a contract which will I think be considered in history as a very infamous act of, well really, blackmail. RJ: Yes okay, so I think we will stop there and we will continue our conversation in part 2. Thanks for joining us! 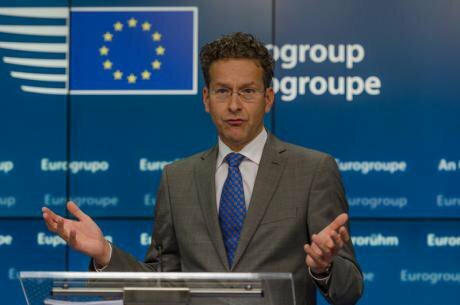 Press remarks by Jeroen Dijsselbloem after summit. July, 2015. Demotix/Jonathan Raa. All rights reserved. Part one of a two-part interview first published here by acTVIsm Munich on July 23, 2015.